Your Bird Can be the Next Kobe! I bought this basketball hoop trick training prop toy for our Severe Macaw Buddy. Within a month he was happily walking down the court and sinking a basket. 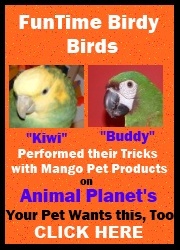 Also, check out the video of Buddy sinking some baskets on Animal Planet's "Your Pet Want's This, Too"
You and your bird will have so much fun putting on shows for all your friends to see. Made of cold rolled steel wire, tubing and sheet metal back plate. Powder coated white then linked with 1/2" replaceable plastic chain. Comes with slotted ball for easy pickup. Ring Height 6-1/2". Total Height 10"
If you don't have a Clicker for Training you can add a Clicker and Training Guide for $4.99. See option below and let the fun begin! Large Basketball Hoop and Ball by Mango for Cockatoo Size Birds5Sarah HoeftJune 26, 2014Basketball is one of the first props I teach all my birds. I enjoy it and they enjoy it! The hoop and ball is a great way to start and it's a perfect height for my guys. Thank you! We love the hoops! Large Basketball Hoop and Ball by Mango for Cockatoo Size Birds4Sharon BanisterMarch 5, 2012Like the idea of the basketball Hoop but Taz enjoys more just knocking it on the floor and making a big noise. He enjoys the interaction and yells WOW. He does have a great time.